Restrepo Documentary – Where’s MOH Recipient Giunta? I just finished watching the Restrepo, a documentary of the fighting in Afghanistan’s Korengal valley. I really enjoyed it. It was very well done, and had a very personal feeling to it because of the way it was filmed. I have a question though, was medal of honor recipient Sal Giunta not on camera at all? I keep looking for him but I swear I couldn’t see him, nor was he one of the guys interviewed during the course of the film. I found this especially surprising considering he was used extensively in all of the promotional videos. From a marketing standpoint, using a guy that was awarded the medal of honor for his actions in the Korengal valley is a good choice considering all of the press such a prestigious award receives. That said, it’s kind of odd to market the film as ‘The Sal Giunta Story’ and not give him any camera time. If I am totally out of my mind and Giunta is actually in the film please let me know in the comments… I just skipped through it again though and couldn’t find him. Sgt. Aron Hijar does bear a resemblance to him though. SSg. Giunta is in 1st platoon of the same company. The documentary follows 2nd platoon only. BTW, I watched it, last week, I think, whenever it first came out on DVD. They have it at Redbox. It’s worth the $1+tax. ah makes sense.. thanks Josh. I think there is some confusion here. Restrepo followed a different platoon than Giunta’s (same company as pointed out by an earlier poster). The film makers were present during the events of “Operation Rock Avalanche” (which is the action Giunta was awarded the MOH for). Then after he was awarded the MOH they went back and made a SEPARATE short film called “The Sal Giunta Story” which is only about 15 minutes long (can be seen for free on the Restrepo official site. Restrepo is not the Sal Giunta story, if he does appear in it, it would only be in the background. 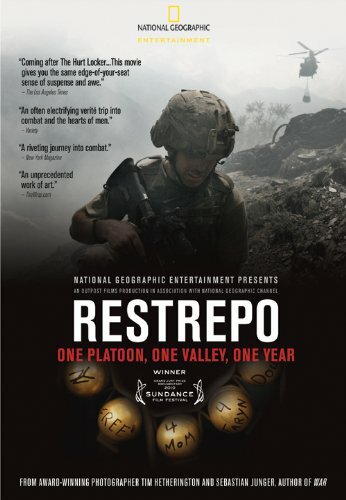 I never saw any marketing for “Restrepo” that in any way referenced Giunta or his MOH, but I have seen marketing for the subsequent short “Sal Giunta Story” documentary which identifies the film as made by the same people as “Restrepo”. That is likely the source of the confusion here. Restrepo opened in theatres before he was awarded the MOH. I think perhaps the awarding of his MOH has sparked renewed interest in the movie and Sebastian Junger’s book. I would hope that he wouldn’t feel additional pressure, either self-pressure or from others. Winning the MOH can’t really be topped. From his earlier interviews with 60 Minutes, he was not really at ease with the idea, since he did what he was supposed to do and that he said that his actions were just a day in the life of Restrepo. It’s a very strange award to receive for your saving your friend but his dying anyways. But he’s said that he was glad his friend never had to spend his last moments in the horror of being a Taliban captive, (and wasn’t much of aware of it either), which is a good thing. I hope they’re not putting him in country again. Unless that’s what he wants. Yeah, but the battle took place during the filming. So the fact that the award came later wouldn’t preclude him from being in the film. We’ve already established why he wasn’t in the film. I would hope that he wouldn’t feel additional pressure, either self-pressure or from others. It undoubtedly will. Giunta is from Iowa (as am I), and, accordingly, there have been quite a few stories in the paper about him. There have also been a couple about previous Medal of Honor recipients from Iowa, and interviews with those that are still alive. They all expressed the same thing that Giunta has – that they feel they did nothing extraordinary to deserve it, and they accepted it on behalf of those who didn’t make it, etc. But they also said that it’s a bit of a curse, because everything in their lives from that point on is measured against that award. It sets the bar for those people extremely high. I feel bad for him for that. Winning the MOH can’t really be topped. That is a huge pet peeve of mine. “Winning” the medal? It’s not an Olympic medal, it’s not a contest, it’s not something that a soldier seeks out and strives to achieve. He didn’t “win” it; he was awarded it. He’s not a “winner”; he’s a recipient. He seems like one of the most genuine and humble guys you could ever meet. There’s part of me that thinks somebody decided that it was time to put a face to the heroism of our soldiers, and came across a recommendation for Silver Star that they decided to upgrade to MOH. Maybe they decided it was time to award it to a living soldier. I don’t know that what he did is above and beyond what many have done to be awarded the SS. That being said, if that was their intention, they were right on the money in whom they picked. When he was on Letterman, it seemed as though he had never, and still did not, intend on making a career of the Army. He’s married to a woman from Iowa (see the Letterman interview for the story on that), and I can picture him returning home to small town Iowa and raising his family there. He certainly seems like the type. I hope he does, and I hope he has great success, and I hope all of the attention never causes any problems for him – at least you can tell he’s not the type that would ever let it go to his head. Right, thanks for point out my poor word choice. I was probably thinking of “winning” as in “they give it to you.” You can’t win something that normally costs you your life. Yeah, we live in celebrity culture these days because of mass media. I hope he can live the rest of his life on his own terms and not be forced to accept the MoH too personally. I haven’t watched the movie yet. I’ve been waiting for the right evening to set aside some time for it. I’ve actually liked ‘Armadillo’ better, it has a much better atmosphere to me. Can I ask everyone where is stuff shy.giunta Salvatore now? Is he still with his wife? Can I ask everyone where is stuff sggt .giunta Salvatore now? Is he still with his wife? I was airborne in the mid 60s at bragg. Istayed there, ihad a busy mos, 31b2p., great nco. I was disqualified 3 times because I wore glasses, finally a desk sargent (the third time I went to him) said to me smith, you really want to do this! I said, yes sargent. He opened a drawer in his desk, took out a small white piece of paper, made a mark on it and said go.I walked across fort benning, duffel bag on my shoulder., felt like a king, did that course in 2 weeks &4 days, right thru xmas of 65.i was drafted and thought, if I have to go there (vietnam), I wanted to get myself trained and work with other soldiers that were better trained. I made my chops with jump school and being at the 82nd. Still proud of it. When sal got his moh, the last word out of that announcers mouth was, airborne. It went thru me like a bolt of lightning.it one of the best things I ever did for myself, it gave me something to reach for when life gets u down. 3rd guy off the drop zone after my 5th jump, drop zone graduation. Airborne!